By the end of the first week on Iwo Jima, VAC had made important gains, though far more slowly than had been anticipated. The key to seizing the remainder of the island north of the two completed airfields was the flat, high ground in the center of northern Iwo, commonly known as the Motoyama Plateau. The plateau itself was relatively level and unmarked by ravines. To the east and west, the ground was broken, descending to the shore in a very irregular pattern of gullies, canyons, and arroyos. The extensive shelling this part of the island had received prior to and since the landings had done nothing to improve the terrain, which was beginning to look like a lunar landscape. Cliffs, often with a sheer drop down to the waterline, were characteristic of the coast along the northwestern, northern, and northeastern shore of the island. obstacle in itself: Hill 382, highest elevation in northern Iwo; a bald knob designated as Turkey Hill,, and the southeastern extension of Hill 382, known as the Amphitheater. Since an advance up either coast did not appear promising the only way for VAC to take the remaining two-thirds of the island was to go up the high ground in the center. Since, from D plus 6 onward, the three Marine divisions on Iwo Jima fought jointly but in clearly defined areas, the narrative henceforth will deal separately with the day-to-day progress of each division as it forged a laborious trail across the island. Since there was no way to bypass the strongest enemy defenses on the Motoyama Plateau, an advance into this veritable hornets' nest became unavoidable. The enemy had to be driven from the high ground in the center of Iwo Jima to permit opening up the western beaches. VAC was working under a tight deadline to clear the beaches, get the airfields back into operation, and unload with all possible dispatch so that ships could be made available for Operation ICEBERG, the invasion of Okinawa, now only five weeks away. not done so to the extent that they were capable. Probably, they feared that such activity, if carried too far, would expose their guns and mortars to aerial observation, and that these mainstays of the defense would fall victim to American artillery and naval gunfire. In any case, as of 25 February, General Schmidt still favored a coordinated advance across the island. Since the 4th and 5th Marine Divisions, which had thus far borne the brunt of the fighting, were already seriously depleted in men and materiel, General Schmidt decided to commit the 3d Marine Division for the assault against the enemy's main defenses in the center of the island. Of the 3d Division's three infantry regiments, the 3d, 9th, and 21st Marines, the latter had already been landed and attached to the 4th Marine Division on 21 February. Three days later, the 9th Marines, commanded by Colonel Howard N. Kenyon, had gone ashore, together with division headquarters, leaving only the 3d Marines afloat. Attached to the infantry were units of the 12th Marines, the 3d Tank Battalion, the 3d Pioneer Battalion, and the 3d Engineer Battalion. By the end of D plus 5, three battalions of the 9th Marines had moved into assembly areas ready to join in the attack. Elements of the 12th Marines, under Lieutenant Colonel Raymond F. Crist, Jr., also came ashore on the 24th, followed by more batteries on the following day. It was 1 March before all of the 3d Division artillery had been landed. Several factors were responsible for the slow debarkation of the artillery. Foremost among these were the lack of landing ships and adverse beach conditions. Having anticipated that his troops would be employed piecemeal, General Erskine had decentralized his artillery while combat loading. Most of the men and equipment of the 3d Division were embarked in attack transport and cargo vessels. It had been planned to put them ashore as needed in landing craft, DUKWs, and amphibian tractors borrowed from the 4th and 5th Marine Divisions. in direct support and 4/13 in a reinforcing role, would be available on the morning of D plus 6. As of 0700, 25 February, the task of clearing the critical central portion of the Motoyama Plateau fell to General Erskine and his 3d Marine Division. The division's route of advance lay across Airfield No. 2, through the remains of Motoyama Village to Airfield No. 3, which was still largely unfinished. As soon as the 21st Marines was returned to its parent division, General Erskine passed the 9th Marines through the 21st to continue the attack, while the latter unit went to the rear to rest and reequip. On D plus 6, the line of departure for the 9th Marines skirted the southwest edge of Airfield No. 2, protruded across to the high ground due north of the center of the field, and then receded to the southern edge, where the regiment tied in with the 4th Division. On the left, 2/9, commanded by Lieutenant Colonel Robert E. Cushman, Jr., faced heavily defended positions along a line of bluffs that extended northward from the western edge of the airfield and the high ground just north of the east-west runway. On the right 1/9, under Lieutenant Colonel Carey A. Randall, was face to face with a low but strategically placed hill subsequently to become known as Hill PETER. (See MapIII, Map Section). Preparations for the 3d Marine Division attack on D plus 6 were similar to those of the previous day. A battleship and two cruisers fired for 20 minutes before the jumpoff. The naval bombardment was followed by a 1,200-round preparation fired by the VAC artillery. More than half of these shells hit the enemy in front of the 3d Marine Division, where the main effort was to be made. Carrier planes pounded the enemy positions with 500-pound bombs just prior to the jumpoff. As soon as the attack got under way at 0930, both the 1st and 2d Battalions of the 9th Marines moved out, with 2/9 making the main effort. Lieutenant Colonel Cushman's men almost immediately drew heavy fire from enemy emplacements to their front and left flank and made little progress. The 1st Battalion made some headway and one platoon actually advanced to the base of Hill PETER, but was unable to hold the position. Since the main effort was to be made on the left, 26 tanks from Companies A and B, 3d Tank Battalion, under Major Holly H. Evans, had been attached to the 2d Battalion. Prior to the attack, Lieutenant Colonel Cushman had weighed the idea of having his infantry ride the tanks across the airfield. In view of the heavy enemy mortar and machine gun fire, this idea had to be abandoned, and the tanks moved out across the airstrip 200 yards ahead of the infantry. Almost immediately, the three leading tanks were hit by enemy antitank fire; two of them flamed, the third was immobilized. The heavy enemy mortar fire directed against the tanks did little damage to the vehicles but inflicted heavy losses on the infantry following in their wake. As the agonizingly slow advance of the 2d Battalion continued, nine tanks were knocked out before some of the enemy installations could be destroyed. battalions had made slight gains, the biggest one being made by 1/9, which in five hours of bitter fighting had advanced 100 yards. The battalions were now separated by a sizable gap which had developed during the intense fighting. As a result, at 1430, the 3d Battalion, commanded by Lieutenant Colonel Harold C. Boehm, was ordered to pass through the right of 2/9 and attack to the north until it had bypassed the center of resistance that had thwarted the advance of 2/9.7 Once this had been accomplished, 3/9 was to effect a junction with the 26th Marines of the 5th Marine Division. As soon as 3/9 began its advance, it started to receive a hail of rifle and automatic weapons fire from the front and the left flank. At the same time, the mortar and artillery fire increased in volume and accuracy. Casualties mounted with alarming speed. Unless the high ground to the battalion's front was quickly seized, the attack was in danger of bogging down. As the Marines crept ahead, the Japanese adjusted their artillery to keep pace with the advance. Within minutes, the two commanders of the assault companies were killed; many more officers and men became casualties. By 1700, losses had become so heavy that units were beginning to show signs of disorganization; the riflemen could not penetrate the curtain of fire thrown up by the enemy and some of the ground previously seized was being ceded.8 Despite the confusion of battle, Lieutenant Colonel Boehm succeeded in reestablishing contact with adjacent units, so that shortly after 1900 the situation had again stabilized and contact existed between all units along the regimental front. As D plus 6 came to a close, the 9th Marines had gained little ground, but, at any rate, the line had moved north of Airfield No. 2 at all points except for the extreme right tip. The regiment had seized a foothold on the rising ground north of Airfield No. 2 from where, on the following day, the attack could be continued. Three additional batteries of the 3d Division artillery came ashore during 25 February and were ready to fire by 1700, The newly arrived units were organized into a provisional battalion under 1/12, and 1/14 was relieved of supporting the regiment. Additional help for the 9th Marines during the day had been furnished by the 21st Marines, which had fired heavy machine guns, 37mm guns, and light mortars at the stubborn enemy defenses. The 81mm mortars of the 21st Marines also had been attached to the 9th Marines during the day, but reverted to control of the parent regiment in late afternoon. 45-minute artillery preparation, The 1st and 2d Battalions attacked abreast, with 3/9 and newly attached 3/21 in reserve. The men of Colonel Kenyon's regiment knew that they were now up against the enemy's main defenses. In front of the regimental zone of attack, Hill PETER and 225 yards to the northwest, Hill OBOE, formed the most important obstacles to the advance. At 0800 on D plus 8, the 3d Marine Division continued its attack, which was preceded by a 45-minute artillery preparation in which corps artillery fired 600 rounds. Once again, the 9th Marines, with the 1st and 2d Battalions abreast and 3/9 and 3/21 in reserve, jumped off. The 1st Battalion on the right immediately encountered devastating enemy mortar, artillery, and small arms fire from well concealed emplacements on and around Hills OBOE and PETER. On the left, 2/9 made an initial advance of approximately 150 yards. The increased employment of armor, particularly in the 2/9 zone of advance, aided the attack materially, even though 11 tanks were knocked out. The infantry, using flamethrowers and rocket launchers to good advantage, made small gains throughout the morning. The 2d Battalion finally reached the base of Hill OBOE, while 1/9 took the top of Hill PETER and began working down the northern slope. At this point, 1/9 was pinned down by fire from well-concealed enemy positions on the reverse slope of the hill. Heavy fire from Hill OBOE also caused the advance of the 2d Battalion to grind to a halt. Just as it appeared that the remainder of the day would pass without any major gains being made, the unexpected occurred. Following a 10-minute preparation by the entire 3d Division artillery, reinforced by the corps artillery, 1/9 and 2/9 jumped off in a coordinated attack. This time, the coordination of all arms brought results, and the Japanese, stunned by the massed artillery fire, were temporarily unable to halt the Americans. Following the preparation, the 2d Battalion moved forward rapidly for a distance of 700 yards. The 1st Battalion overran Hill PETER, continued down the reverse slope and drove up to the crest of Hill OBOE. Now that most of the enemy fire from the two important hills had been silenced, Lieutenant Colonel Cushman's 2nd Battalion moved forward rapidly for approximately 1,500 to 1,700 yards. For the first time since the beginning of the attack, the lines of 2/9 now were abreast of those of the 1st Battalion. On Wednesday, 28 February, the 3d Marine Division continued its drive to the north. The last day of February marked the tenth day since the Marines first had stormed ashore on Iwo Jima. Optimistic forecasts to the contrary, somewhat less than half of the island had been taken thus far. No one ashore doubted that fighting of the utmost severity still lay ahead. until it reached the eastern shore just north of the eastern terminus of the O-2 Line near Tachiiwa Point. Before dawn on D plus 9, the 21st Marines, with the 3d Tank Battalion and the 81mm mortar platoons of RCT 9 attached, relieved the 9th Marines. Enemy snipers and machine gunners interfered with these movements, but by 0815 the relief was essentially completed and the 9th Marines passed into division reserve. Following a 30-minute preparation by the division artillery, reinforced by corps artillery, the 21st Marines continued the attack at 0900 with the 1st Battalion on the left and 3/21 on the right; the main effort was to be made by 1/21. The artillery preparation was followed by a seven-minute rolling barrage which lifted 100 yards every minute to extend 700 yards beyond the front lines. The 1st Battalion advanced about 500 yards when it was stopped by hostile mortar and small arms fire. On the right, 3/21 also made good progress, closely following the barrage and, within a half hour after the jump-off, had gained 400 yards. As the morning wore on, elements of 3/21 became intermingled with 4th Division troops near the division boundary. Now there were only three tanks left out of the 22 which Colonel Nishi had been able to obtain the previous December, all of which had been carefully dug in. Shortly before noon, the attack bogged down all along the 3d Division front. At this time, 3/9 was attached to the 21st Marines and by VAC order, 4/13 reverted to the 5th Division control, after having been attached to General Erskine's division for several days. rolling barrage. As a result, only small gains were made. At 1700, when the assault troops halted for the night, units held a winding but continuous line across the division front. As night fell over the battle-scarred island, it appeared that the 3d Marine Division had burned and blasted its way through the center of the Japanese main line. To either side of the 3d Division, however, neither the 4th nor the 5th had kept pace with General Erskine's men. As a result, the VAC operation order for 1 March made a change in the quantity of supporting fires that would be made available. The lion's share of artillery support no longer would go to the 3d Marine Division; instead, the corps artillery henceforth was to divide its fires equally among the three divisions. By morning of 1 March, all battalions of the 12th Marines were ashore. For the remainder of the operation, until the 3d Marine Division reached the northeast coast, Erskine's modus operandi remained the same. He brought all the fire power available to him to bear against the enemy. Neutralization furnished by his own guns and by the corps artillery, when available, enabled him to push forward. As soon as he sensed a weak spot in the enemy defenses, he exploited the situation by committing reserves at the flanks and through the gaps that were created as his two assault regiments moved forward. The advance across Motoyama Plateau did not leave room for any additional maneuver. Erskine's zone of action was sufficiently narrow and his reserve sufficiently deep to permit him to employ these tactics more readily than could the other division commanders who were operating on wider fronts and across more difficult terrain. Cates and Rockey were equally competent, but the Third Division was in the pivotal position. At 0830 on 1 March, the 21st Marines continued the assault with 2/21 and 3/21 abreast, the latter making the main effort. Once again, the attack was preceded by a heavy artillery preparation. The 12th Marines fired a 15-minute preparation in support of the attack, reinforced by VAC artillery. Direct support destroyers fired a half-hour preparation from 0800 to 0830, deepening the fires of the 12th Marines. The heavy artillery preparation was followed by a rolling barrage which lifted 100 yards every eight minutes for 300 yards. The 1st Battalion remained behind on the left flank to mop up the enemy pocket that the regiment had bypassed on the previous day. As the two battalions jumped off, the 2d Battalion, which had attacked to the north on 28 February, pivoted on its right and advanced towards the northeast. Initially, both battalions made good progress, particularly 2/21 which was receiving effective tank support. As a result, the 21st Marines was moving well ahead of elements of the 5th Marine Division to the left. In order to protect the left flank of 2/21 and seize the left boundary of the division's zone of action, at the same time encircling the enemy pocket, 3/9 was committed in support of 1/21 in the course of the morning. The 3d Battalion, 9th Marines, advanced against light resistance and prior to 1500 had arrived at the division's left boundary. By this time 1/21, attacking generally north to mop up the pocket of resistance to its front, had eliminated it and also had reached the boundary of the division to the left of 3/9. By VAC order, at 1500, the boundary between the 3d and 5th Marine Divisions was adjusted to shift the position held by 1/21 to the 5th Division sector. The latter division was ordered to extend to the northeast and relieve 1/21. The three hills were situated in such proximity that the two on the right fell into the zone of advance of the 3d Division, while a portion to the left was just beyond the division boundary. Since the capture of this high ground was deemed essential for the further advance of General Erskine's division, it was shifted from General Rockey's zone to that of the 3d Marine Division. Even so, the Japanese would be able to delay any advance on General Erskine's left until the 5th Division had been able to pull up alongside. The center of the secondary line of resistance thus would have to be broken by a frontal assault against the southeastern hill mass. Several days were to pass before this second line could be cracked. In the meantime, General Erskine, "his available infantry substantially weakened by the furious fighting of late February,"17 had little choice but to continue the assault. Thus, at 1545 on 1 March, he decided to launch a coordinated attack with both regiments abreast, while the 9th Marines took over a portion of the zone of action of the 21st Marines, with 3/21 and a tank company attached. The 3d Tank Battalion, less one company, was to remain attached to the 21st Marines. The attack actually got under way at 1645, the 9th Marine passing 1/9 through 3/21, which took up a reserve position in the vicinity of Motoyama Village. The 2nd Battalion, 9th Marines, went into reserve. The afternoon attack was preceded by a five-minute preparation fired by the division artillery and direct support destroyers, followed by a rolling barrage. Enemy resistance remained heavy, particularly in front of the 9th Marines, and little ground was gained. When lines were consolidated shortly after 1800, General Erskine had contact with both adjacent divisions. Even though the afternoon attack had brought little gain, some progress had been made during the day, and the 21st Marines, in the course of the morning, had advanced 500 yards to deepen the breach in the heavily fortified enemy defense line. On the evening of 1 March, the two 3d Division regiments faced northeast from positions about 600 yards east of Motoyama Village, along a line running north across the western portion of Airfield No. 3. On the morning of 2 March, the 3d Marine Division continued its attack with the 21st Marines and the 9th Marines abreast. The 21st Marines attacked with 3/9 attached on the left and 1/21 on the right, while the 9th Marines attacked with 2/9 on the left and 1/9 on the right. The attack, which jumped off at 0800, followed a 15-minute artillery and naval gunfire preparation. Again, a rolling barrage preceded the assault units. Tanks, using direct fire, participated in the advance. Almost immediately, the 9th Marines ran into heavy small arms, mortar, artillery, and antitank gun fire. The supporting tanks were able to destroy one enemy gun and several emplacements; at the same time, it was becoming apparent that Colonel Kenyon's men were facing an exceptionally strong and well organized enemy position. The 21st Marines, advancing in a column of companies, made only small gains before the attack bogged down by heavy machine gun and antitank gun fire from Airfield No. 3. Only 3/9, supported by tanks firing directly on emplacements, was able to move forward. By 1300, 3/9, advancing against strong enemy resistance, had secured a foothold on the rising ground in front of Hill 362B. By this time, the battalion had advanced beyond the units on its right and left regardless of flank security. Using 60mm and 81mm mortars, the Marines slowly moved up to a ridge that would serve as the final jumpoff position for a direct attack on the final objective. As a result of heavy enemy resistance, the attack came to a standstill in early afternoon. A new assault, following a powerful artillery preparation, was launched at 1530. Eight artillery battalions took part in this preparatory fire. As had become customary by this time in 3d Marine Division attacks, the original preparation was followed by a rolling barrage. But even with such powerful support, the infantry was unable to score any notable gains. At 1730, the commanding officer of 2,/21, Lieutenant Colonel Lowell E. English, was wounded, and the executive officer, Major George A. Percy, took over command. In tying-in for night defense, one company of 2/21 had to be pulled back a short distance from its exposed position. A slight withdrawal also became necessary for 3/9 to more favorable night positions. 3d Division Marines were to spend a restless night. Throughout the hours of darkness, the enemy remained very active in the broken terrain in front of the 21st Marines. Since Airfield No. 3 was still covered by enemy fire, it was not possible to occupy a continuous line. During the night 2-3 March, luck played into the hands of the 3d Marine Division. 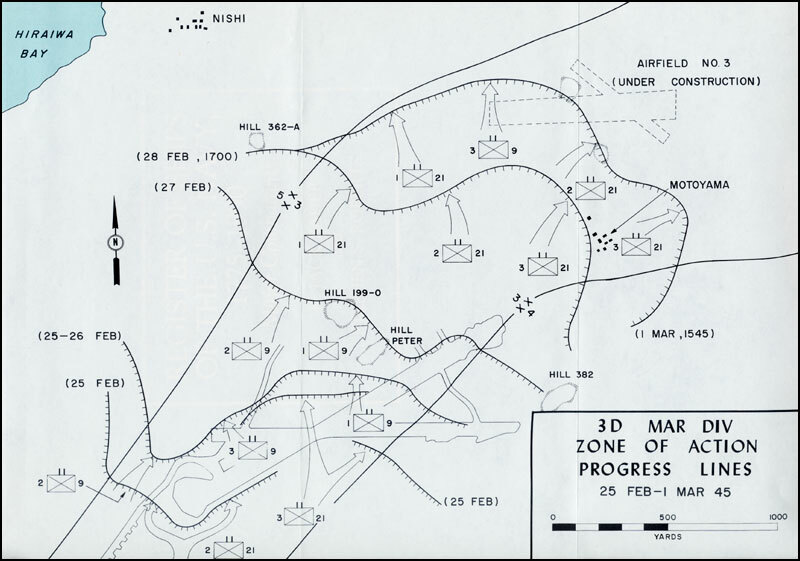 An enemy sketch of the defensive area facing the division, particularly the zone of action of the 9th Marines, fell into General Erskine's hands. This map had been captured by the 21st Marines and was immediately forwarded to the division command post, where it was translated. The captured sketch bore out the belief that the 9th Marines was in contact with a strongly organized enemy position, if there had been any doubt left. General Erskine now hoped that he might find a soft spot in the enemy defenses, through which a wedge could be driven, somewhere between the enemy holding up the 9th Marines and the strong enemy defenses near Hill 362B. The VAC operation order for 3 March called for elements of the 5th Marine Division to relieve 3d Division units near Hill 362B by 1000. In line with this relief, General Erskine planned to adjust the boundary between his regiments so that the zone of attack of the division was again equally divided. In consequence, the 21st Marines once again would be attacking northeastward. At 0800 on 3 March, the 3d Marine Division resumed the attack with the same formation but with a new boundary between the regiments. The assault was preceded by a 10-minute preparation by the division artillery and direct support destroyers, followed by a rolling barrage. Almost immediately, the 9th Marines drew such heavy fire that it was unable to advance. In the zone of action of the 21st Marines, 3/9 maintained its position while waiting to be relieved by elements of the 5th Division. This relief was accomplished in the course of the day, but the maneuver was complicated by the fact that both the relief force and 3/9 became embroiled in time-consuming fire fights with the enemy. In the zone of action of the 21st Marines, 2/21 advanced slowly under heavy fire and shortly before noon secured a foothold on Hill 357. At this time it was believed that no major resistance remained in front of 2/21, though it was still receiving heavy fire from the high ground to its left in the zone of action of the 5th Marine Division. General Erskine decided to change the direction of attack by assigning a new boundary between regiments in order to attack the flank of the enemy defensive area opposite the 9th Marines. Accordingly, an attack to the southeast was launched at 1500 with the main effort on the left. The afternoon assault followed a five-minute artillery and naval gunfire preparation. The 1st Battalion, 21st Marines, initially made rapid progress and advanced for about 250 yards to its front. The 2d Battalion seized the high terrain on Hill 357 along the eastern edge of the Motoyama Plateau, but was unable to continue its drive because of heavy flanking fire from hills in the 5th Marine Division zone of action. The movements of 1/21 were facilitated by a platoon of tanks attached to the 21st Marines which, from positions in the vicinity of Motoyama Village, effectively supported the battalion's attack by placing direct fire on targets in front of 1/21. In resuming its attack during the afternoon of 3 March, the 9th Marines once again ran into a stone wall and no gains were made. In an attempt to make some progress, Colonel Kenyon committed tanks singly and in small groups in the broken terrain. The armor did what it could and, in fact, reduced a number of enemy emplacements and some guns. Nevertheless, the tanks were unable to breach this enemy position sufficiently to permit an advance by the infantry.21 The Japanese emplacements, cleverly hidden in the chaotic jumble of torn rocks, could not be detected, because enemy artillery, mortars, and small arms firing from these positions were using smokeless powder as a propellant. In addition, the heavier weapons were not as active as they had been on previous days, but the fire from antitank guns and machine guns was devastating. At 1800, the attack halted and the assault battalions consolidated for the night as best they could. In the zone of action of the 21st Marines, 2/21 and 1/21 made physical contact, but an open flank remained on the right of the 21st adjoining the 9th Marines. The gap was 250 yards wide and covered by fire. It would not take the combat-wise Japanese long to note the existence of this gap and take advantage of it. Most of the action in the 3d Division zone of attack on D plus 12 had taken place in the northern half of the zone, where the 21st Marines had seized nearly all of the high ground northeast of the airfield. Beyond that, they had launched a drive to the southeast to envelop the enemy to the south. The 9th Marines, having made little headway, remained in substantially the same positions it had occupied all day. The VAC attack on 4 March had been scheduled to jump off at 0815. General Erskine initially had issued orders for 3/21 to be released to the 21st Marines. The battalion was to have moved prior to daybreak, passing through 1/21 and continuing the attack to the southeast to seize Hill 362C. In view of the confusion caused by the enemy infiltration, General Erskine had to secure permission from VAC to delay the 3d Division attack until 3/21 could complete its mopping up and get into position to attack. The battalion started to move shortly before 0700, at which time it reverted to its parent regiment. In crossing the area to the northwest and north of Airfield No. 3, the battalion drew heavy fire from enemy mortars and small arms. Extremely poor visibility further delayed and hindered preparations for the passage of lines, so that 3/21 did not reach its positions until 1100. Forty minutes later, the division attack jumped off, again preceded by an artillery preparation and a rolling barrage. The same scheme of maneuver used on the previous day was employed, except that 3/21 passed through 1/21. Once again, the 9th Marines was unable to penetrate the enemy positions to its front. Similarly, the 21st Marines encountered heavy resistance, including direct fire from artillery pieces that were difficult to locate; little progress was made. Still unable to advance because of hostile flanking fire from the high ground to its left in the zone of action of the 5th Division, 2/21 suffered heavy casualties. of the 3d Marine Division were tied in with each other, as well as with 5th Division units on the left and the 4th Division on the right. Late in the afternoon of D plus 13, a welcome dispatch from VAC reached the exhausted troops of all three Marine divisions.24 Except for limited adjustment of positions, no attacks were to be launched on 5 March. Instead, present positions were to be held and one battalion of each regiment was to be rested, reorganized, and prepared to resume the assault on the following day, when all three divisions were to launch a coordinated attack. On 5 March, the 3d Marine Division held an irregular line with 2/21, 3/21, 1/9, and 2/9, while the other two divisions spent the day receiving replacements and equipment to strengthen their tired and depleted units for the attack on 6 March. Two companies of the 21st Marines were pulled back from their positions on the line to rejoin the 1st Battalion in an assembly area north of Airfield No. 2. The men of 3/9 remained in position as division reserve between the northeast-southwest runway and Motoyama Village. VAC orders called for a resumption of the attack on 6 March. Since any further advance by 2/21 was dependent directly on the progress made by the adjacent 5th Division, the 2/21 attack was to be coordinated with that of General Rockey's men. The advance of 2/21 was so timed that the battalion would move out at 0800, one hour ahead of the remainder of the 3d Division, which would launch its assault in conjunction with that of the 4th Division. Except for the staggered timing, no other changes were made in the previous scheme of maneuver. At 0600 on 6 March, 3/9 was attached to the 21st Marines in preparation for the attack. For ten minutes prior to the jumpoff of 2/21, three battalions of the 12th Marines, three battalions of the 14th Marines, and one battalion of the corps artillery laid down a heavy preparation, which was further supplemented by naval gunfire. However, no sooner had 2/21 attacked than it became apparent that the artillery preparation had been totally ineffective. The advance bogged down almost at once in the face of heavy enemy mortar and small arms fire coming from the high ground in the zone of action of the 5th Marine Division. Prior to the jumpoff of 3/21 and the 9th Marines, three battalions of the 12th Marines and one battalion of the corps artillery fired two five-minute preparations, which were further supplemented by naval gunfire which continued for an hour and a half. A rolling barrage was also fired in support of the attack. Nevertheless, despite all this expenditure of ammunition, results remained negligible. As soon as the remainder of the 3d Division attacked at 0900, it drew such heavy fire from enemy small arms, mortars, artillery, and antitank guns that any advance was all but out of the question. A second push was ordered for 1440, again preceded by a heavy artillery preparation. This time 1/21, having passed through 3/21, was able to score some gains against continued bitter enemy resistance, slowly advancing for 200 yards before lines were consolidated at 1800 for the night. Once again. the progress made was completely out of proportion to the ammunition and effort exerted, During the two preparatory fires on the morning of 6 March, 11 artillery battalions had expended 2,500 rounds of 155mm howitzer ammunition and 20,000 rounds of 75mm and 105mm shells.27 In addition, a battleship and cruisers had fired an additional 50 rounds of 15-inch and 400 rounds of 8-inch ammunition. Carrier-based aircraft had bombed and strafed the Japanese positions, all apparently without eliminating the enemy's power to resist. to the weary Marines just how far they had come, despite all adversities. It also served as a distant promise that there would be an end to the ordeal all of them were undergoing. On the evening of 6 March it was apparent that the Japanese positions on northern Iwo would not yield to the tactics that had been thus far employed. At the same time, General Erskine was keenly aware of the heavy losses that were draining the offensive strength of his division. As a result, despite the known risk inherent in such 'an operation, he ordered an attack against Hill 362C under cover of darkness. It was hoped that employment of the element of surprise would yield results where all other conventional means had failed. Instead of attacking at 0730 on the morning of 7 March, as specified in VAC orders issued late on 6 March,29 General Erskine requested and received permission to jump off at 0500. The 21st Marines was to make the main effort. Its objective was to seize Hill 362C, while the 9th Marines was to advance for about 200 yards in the darkness as a diversionary measure. Actual seizure of Hill 362C was to be executed by Lieutenant Colonel Boehm's 3/9, which was attached to the 21st Marines. The order for the attack on Hill 362C, received verbally over the telephone from Colonel Eustace Smoak, executive officer of the 21st Marines, was simply to attack at 0500, using the present front lines of 1/21 as a line of departure, maintain maximum secrecy and silence, and seize the hill. My complaint that I had never seen the ground was countered by the assurance that Major Bob Houser, CO 1/21, would give me all the details on the lay of the land to the front, point out the objective, etc. etc., "Don't worry about a thing, Houser's been observing the ground all afternoon, he'll give you all the dope." made in any radio traffic, nor was the assault to be preceded by any artillery preparation, except for white phosphorus shells fired around the objective five minutes before the jumpoff. The men were ordered to move as quietly as possible. No one was to fire until it became certain that the enemy had discovered the main body of the assault force. The assault companies moved out of their assembly areas at 0320 for the line of departure. A light rain was falling throughout the night, and the darkness that engulfed everything on the island was broken only by the naval gunfire illumination, which ceased before the attack was launched. It had not. At 0500, the assault companies climbed out of their holes and silently headed southeastward towards Hill 362C assumed to be 250 yards away. The surprise attained was total and 3/9, catching the enemy asleep in his emplacements, took a heavy toll with flamethrowers and automatic weapons. Shortly after 0530, a Japanese machine gun came to life. It was quickly silenced by a flamethrower, and Lieutenant Colonel Boehm's battalion continued its slow but determined advance towards the objective. By this time, sporadic enemy resistance was making itself felt, but still the advance continued. objective still lay 250 yards ahead. Apparently, the battalion's jumpoff positions had been somewhat further back than anyone had realized. While 3/9, as part of the 21st Marines, was to make the most spectacular gains for the day, the remainder of the 9th Marines was to see some of the most bitter fighting of the Iwo operation. While 3/9 was attacking southward towards Hills 331 and 362C, 1/9 and 2/9 attacked eastward, also in the general direction of Hill 362C. By daybreak the 9th Marines, with the 2d Battalion on the left and the 1st Battalion on the right, had advanced about 200 yards. However, at first light of day the enemy, consisting of Baron Nishi's 26th Tank Regiment, awoke to the presence of the intruders and put up a fierce opposition. The 2d Battalion, which had already advanced into the enemy fortifications, began to draw heavy fire from the front, flanks, and rear. For all practical purposes, the two battalions were cut off and casualties were heavy. By midmorning it became apparent that the 9th Marines could not break through the resistance it faced from the front, and General Erskine shifted the regimental boundaries so that the advance of the 21st Marines would pinch out the 9th. Around noon, 1/9 regained some freedom of movement and attempted to establish contact with elements of 3/9 atop Hill 362C. This attempt which, if successful, would have caught Baron Nishi's men in a giant vise, failed. Instead, elements of 2/9 were themselves surrounded and unable to move in any direction. Tanks sent forward in support of 2/9 were unable to get through, though they did relieve some of the pressure on the surrounded units. At dusk on 7 March, elements of 2/9 were still pinned down. It would be 36 hours before two companies of Lieutenant Colonel Cushman's battalion would be able to extricate themselves from the encirclement. Just about that length of time would be required before the first Marines of the 3d Division reached the coast. It would not be an easy advance for the men of 2/21, 1/21, and 3/9 who would continue the drive for the sea, while Marines of 3/21 and 2/9 would continue to chip away at a stubborn pocket of enemy resistance that still showed no sign of disintegrating. On the morning of 8 March, D plus 17, the men of the 3d Marine Division resumed the attack, this time with conventional tactics. The attack was preceded by a 10-minute artillery preparation. Destroyers offshore supported the division and corps artillery with a half-hour bombardment. Once again, a rolling barrage was employed. The 21st Marines jumped off with the 1st and 2d Battalions abreast, 1/21 on the right. The advance of 2/21 had to be coordinated with that of the adjacent 5th Marine Division. This time, the Japanese were wide awake and the 21st Marines received heavy flanking fire from the sector of the adjacent division, as well as from the zone of action of the 9th Marines, whenever an attempt was made to move down to the cliff overlooking the beach. Nine tanks from the 3d Tank Battalion supported 2/21 as best they could by shelling caves and pillboxes in the rugged terrain over which the battalion had to advance. To the right of 2/21, the 1st Battalion was making slow progress and by evening had advanced 300 yards through what was believed to be the final organized enemy defenses before the coast was reached. In the zone of action of the 9th Marines, 3/9 attacked eastward from Hill 362C, passing 3/21, which had been attached to it, and moving through the right of 1/9. The intermediate objective of 3/9 was the edge of the plateau overlooking the beach; the final objective was the beach itself. Despite tenacious enemy resistance, the battalion advanced some 400 yards beyond Hill 362C towards the beach. At times it appeared that, despite the ferocity of the battle, enemy resistance was less organized and assumed the dimensions of a "last ditch" fight.34 In order to assist the battalion in its drive through the broken terrain, in which sandstone buttes abounded, a destroyer fired into the draws that led down to the sea; an air strike also was directed into the same general area. By late afternoon, 3/9 had seized the intermediate objective and was ordered to hold up the advance on the high ground. men, rushing from one standstone butte to another, fought Indian style, blasting away at the enemy defenses here and there, but nowhere could the pocket be dented. The following day, 9 March, saw the continuation of the 3d Division drive to the sea. Once again, 3/9 jumped off following the customary preparation and advanced towards the beach. While still very much in evidence, enemy resistance was becoming more sporadic. By late afternoon, 3/9 had penetrated down to the beach, both 3/9 and 1/21 dispatching patrols to the water's edge. In support of the two battalions, an air strike was directed against an obstinate enemy pocket in the zone of action of the 5th Division. In addition, a destroyer offshore, with the 3d Division naval gunfire officer on board, fired on caves and enemy positions in the beach area. Once again, the 9th Marines, with 3/21 attached, hit a stone wall of resistance. Even though tank support was available, the terrain severely limited the employment of armor. The enemy was not slow to take advantage of this situation. He first fired a number of air bursts over one of the tanks in order to disperse the infantry. Once this had been accomplished, he dispatched a demolition detachment under cover of a smoke screen which put the tank out of action with a demolition charge and a Molotov cocktail. Neither 2/9 nor 3/21 were able to score any sizable gains during the day. 1. These replacements were the only ones available. VAC could do nothing about additional training. 2. If not used for shore party duty, separate troops would have been required for that, necessitating additional shipping. 3. Shore party requirements should be reduced as the advance continued. In fact some pioneers were used later as frontline troops. In any case, by evening of 9 March, General Erskine had achieved his primary mission which was to break through to the northeastern shore of the island. The initial approach to the beach had been made by elements of Company A, 21st Marines, who were later joined by 3/9. By nightfall the 3d Division Marines held nearly 800 yards of shoreline, thus cutting the area still in enemy hands into two separate sectors. At the northern tip of the island, near Kitano Point, General Kuribayashi would continue to offer stubborn opposition. This last vestige of enemy resistance would be eliminated only after protracted fighting by elements of both the 3d and 5th Marine Divisions. Upon reaching the northeast coast after their arduous and costly advance through the center of Iwo, elated 3d Division Marines sent back a canteen filled with sea water to General Schmidt, marked "for inspection, not consumption." General Kuribayashi and the remnants of his garrison still held one square mile in the north of the island, determined as ever to sell their lives as dearly as possible. Small though tenacious pockets of resistance remained in the southeastern portion of Iwo. But an end to the terrible slaughter was finally in sight. 1. Unless otherwise noted, the material in this chapter is derived from: VAC AR; 3d MarDiv AR; 3d MarDiv Staff Memos, 23Jan-17Mar45, hereafter 3d MarDiv Staff Memos; 3d MarDiv G-1 PerRpts; 3d MarDiv D-2 Jnl; 3d MarDiv G-2 PerRpts, 14Feb-4Apr45, hereafter 3d MarDiv G-2 PerRpts; 3d MarDiv G-3 PerRpts, 16Feb-27Mar45, hereafter 3d MarDiv G-3 Per Rpts; 3d MarDiv G-4 Jnl, 16Feb-8Apr45, hereafter 3d MarDiv G-4 Jnl; 3d Mar AR, 5Nov44-8Mar45, hereafter 3d Mar AR; 9th Mar URpts, 26Feb-4Apr45, hereafter 9th Mar URpts; 9th Mar UJnl, 24Feb-11Mar45; 9th Mar AR, 24Feb-4Apr45, hereafter 9th Mar AR; 12th Mar AR, 25Feb-16Mar45, hereafter 12th Mar AR; 21st Mar UJnl, 24Feb-16Mar-45; 1st ProvFldArty Gru G-1 Jnl, 9Jan-15Mar45; Iwo Comments; Bartley, Iwo Monograph; Morehouse, Iwo Jima Campaign; Newcomb, Iwo Jima; Newcomb Notes; Aurthur and Cohlmia, The Third Marine Division; Isely and Crowl, U.S. Marines and Amphibious War; Benis M. Frank, A Brief History of the 3d Marines (Washington: HistBr, G-3 Div, HQMC, 1963), hereafter Frank, Brief History of the 3d Marines. 2. Additional material in this section is derived from: 1/9 AR, 15Jan-6Apr45, hereafter 1/9 AR; 2/9 AR, 24Feb-7Apr45, hereafter 2/9 AR; 3/9 UJnl, 24Feb-18Mar45; 3/21 URpts, 25Feb-12Mar45, hereafter3/21 URpts; 3d TkBn AR, 7Nov44-27Mar45, hereafter 3d TkBn AR. 3. Isely and Crowl, U.S. Marines and Amphibious War, pp. 489-490. 4. Newcomb, Iwo Jima, p. 188. 5. General Harry Schmidt ltr to CMC, dtd 28Oct52,in Iwo Comments. 6. Isely and Crowl, U.S. Marines and Amphibious War, p. 491. 7. In commenting on this order, the CO, 3/9 had this to say: "2/9 reported being pinned down by heavy enemy fire - unable to move - and it was through this kind of fire that 3/9 was expected to execute a 'passage of lines'; a poor decision at best!" Col Harold G. Boehm ltr to Head HistBr, G-3 Division, HQMC, dtd 17Ju169 in Iwo Comments, hereafter Boehm ltr. 8. "The losses of key and seasoned personnel in this . . . attack manifestly reduced the battalion's effectiveness in later situations." Boehm ltr. 9. 3d MarDiv AR, p. 48. 10. VAC OpO 6-45,dtd 25Feb45. 11. 9th Mar AR, p. 5. 12. Additional material in this section is derived from: VAC Arty Rpt; 21st Mar URpts, 26Feb-26Mar45, hereafter 21st Mar URpts. 13. Newcomb, Iwo Jima, pp. 203-204. 14. 3d MarDiv AR, p. 38. In connection with this report the VAC chief of staff was to comment that: "It was essential that no substantial gaps occur, therefore it was necessary for the 4th and 5th Divisions to advance also, which necessitated adequate support"; and "Half of the Corps artillery was assigned to the 3d Division as well as the bulk of the naval gunfire support, in addition to elements of the 12th ashore, and at least standby support from the 13th and 14th." Rogers ltr. 15. Isely and Crowl, U.S. Marines and Amphibious War, p. 494. 16. Isely and Crowl, U.S. Marines and Amphibious War, p. 496. 18. Boehm ltr. There were three hills with an elevation of 362 feet on Iwo Jima. In order to avoid confusion, they were designated as A, B, and C. Hill 362A was located in northwestern Iwo in the 5th Division sector. Hill 362B, also in the 5th Division sector, was in the north-central portion of the island. Hill 362C, located to the northeast, was in the 3d Division zone. 19. "This enabled the 5th Division to occupy the hill with little difficulty the following day, which they hadn't previously been able to do at all. The majority of enemy gun emplacements on the 362B hill mass had been destroyed." Boehm ltr. 20. 3d MarDiv AR, p. 12. 22. Newcomb, Iwo Jima, p. 218. 23. 3d MarDiv AR, p. 12. 24. VAC Dispatch, 1624, 4Mar45. 25. Isely and Crowl, U.S. Marines and Amphibious War, p. 97. 26. Newcomb, Iwo Jima, p. 224. 27. VAC Arty Rpt, pp. 14-15. 28. Additional material in this section is derived from: 3d EngBn URpts, 26Feb-9Apr45, hereafter 3d EngBn URpts; 3d Amtrac Bn, AR, dtd, 18Mar45, hereafter 3d Amtrac Bn AR. 29. VAC OpO 14-45, dtd 6Mar45. 31. Maj Robert D. Heinl, Jr., "Dark Horse on Iwo:' Marine Corps Gazette, v. 29, no. 8 (Aug 45), p. 58. 32. 3d MarDiv AR, p. 15. 33. 9th Mar AR, Encl C, p. 11. 34. "This is exactly what it was, but with the inevitable 'handwriting on the wall' they fought like Hell." Boehm ltr. 35. 3d MarDiv AR, p. 17. 36. Hough, The Island War, p. 335. 38. Isely and Crowl,U.S. Marines and Amphibious War, pp. 497-498.